Monza, Italy: Lewis Hamilton drew level with legendary racing drivers Juan Manuel Fangio and Ayrton Senna in the record books on Saturday when he flew to pole ahead of Nico Rosberg for Sunday’s Italian Grand Prix. The championship leader and defending three-time champion clocked a best lap time of one minute and 21.135 seconds to outpace the German by nearly half a second. The ‘silver arrows’ dominated the session to finish comfortably ahead of the Ferraris of Sebastian Vettel and Kimi Raikkonen. It was Hamilton’s third successive pole at the Italian event and his fifth in all at Monza, a feat that equalled those of Argentine Fangio and Brazilian Senna. It was also the 56th pole of Hamilton’s career. Senna was the last man to achieve a hat-trick of Italy poles. 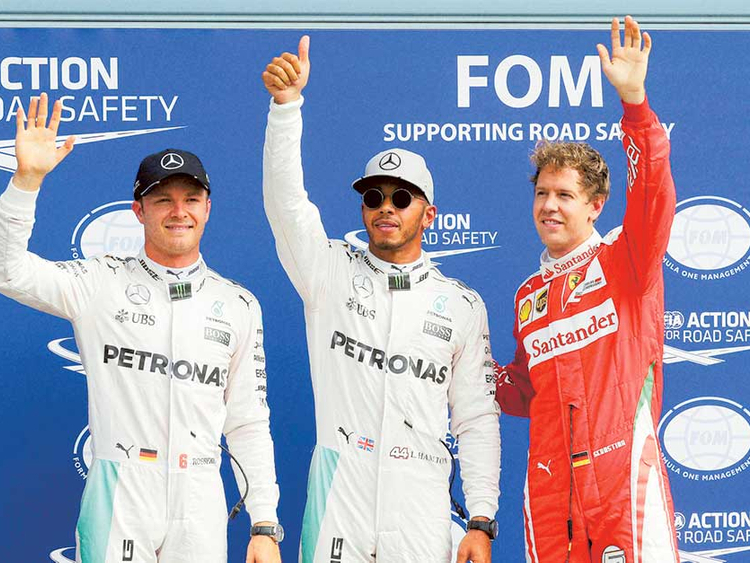 Hamilton and Rosberg’s front row lockout was Mercedes’ 41st and enabled them to equal the record of dominance set by Red Bull pairing Vettel and Mark Webber in their heyday. Hamilton will be bidding on Sunday to register a hat-trick of Italian wins with his 50th career victory to enlarge his nine points lead in the title race ahead of Rosberg. His pole made a pleasant change from last weekend’s grid when Hamilton started last in Belgium after penalties, charging through the pack at Spa-Francorchamps to claim third. Valtteri Bottas was fifth for Williams ahead of Australian Daniel Ricciardo and his Red Bull teammate, Dutch teenager Max Verstappen. Sergio Perez was eighth ahead of his Force India teammate Nico Hulkenberg with Esteban Gutierrez taking 10th for Haas. The session began in near-perfect conditions, with late-summer sunshine bathing the old royal park north of Milan. Newly arrived French driver Esteban Ocon produced the first incident in his Manor after seven minutes, when he stopped at the first chicane. Yellow flags were soon waved, but only after the two Mercedes had gone through to set the early pace, Hamilton topping the times with 1:21.854. Aware of the dangers, Hamilton radioed the team. “We’ve got to make sure we don’t get stuck behind people again,” he said. Ocon’s misfortunes meant he was eliminated along with the two Renaults of Kevin Magnussen and Jolyon Palmer, the two Saubers of Marcus Ericsson and Felipe Nasr and the out-of-sorts luckless Daniil Kvyat of Toro Rosso. The Q2 segment began with both Mercedes out on softs ahead of the rest, Rosberg clocking 1:21.809 only for Hamilton, who ‘flat-spotted’ his right front tyre, to beat that by three-tenths. Drivers must start Sunday’s race with the tyres they used in Q2, meaning Hamilton may have a disadvantage unless he is allowed to change his tyre on safety grounds. Felipe Massa, in his last Italian Grand Prix, qualified 11th in his Williams to miss out on the top ten shootout. He went out with Romain Grosjean of Haas, in 12th, who also picked up a five place penalty for a gearbox change, Fernando Alonso of McLaren and Pascal Wehrlein of Manor, in a notable 14th. Jenson Button was 15th in the second McLaren ahead of Carlos Sainz in the leading Toro Rosso. While the Mercedes men led the way, Esteban Gutierrez shone for Haas in taking seventh ahead of Verstappen and the two Force Indias. The Mercedes were swiftly out and into their stride again with Hamilton beating Rosberg by nearly three-tenths with his first run to set up an increased gap in the final rush.